Authorities in Miami are asking for the public's help identifying a woman caught on video possibly being abducted. UPDATE: Sunday afternoon the Miami Police Department tweeted that the woman was located safety. They say detectives are following up. They didn't release any other information. MIAMI, Fla. — Authorities in Miami are asking for the public's help identifying a woman caught on video being abducted, according to the Miami Police Department. "We're asking anyone with any information in regards to this abduction, this kidnapping, please come forward with any and all information," Miami Police Commander Freddie Cruz said. "Any information at this moment is important." 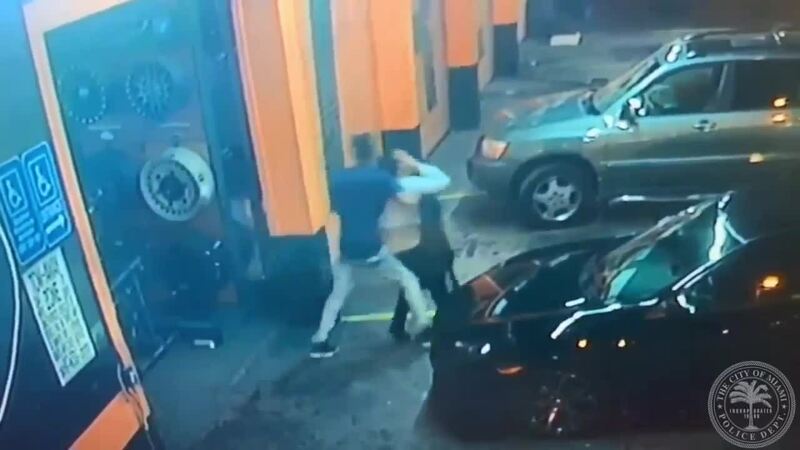 Video shows the woman approach two men outside of Le Ceiba Tire Shop, located at 2345 NW 36 St., on Friday. Then it shows the woman being pulled out of the tire shop by a man and led to a white car after it quickly pulled into the lot and stopped. "This is someones daughter, someones sister, someones family member," Cruz said. "We need apprehend this individual. We need to bring this young lady back home to safety." The vehicle is described as a newer model white Nissan Altima with a paper tag.